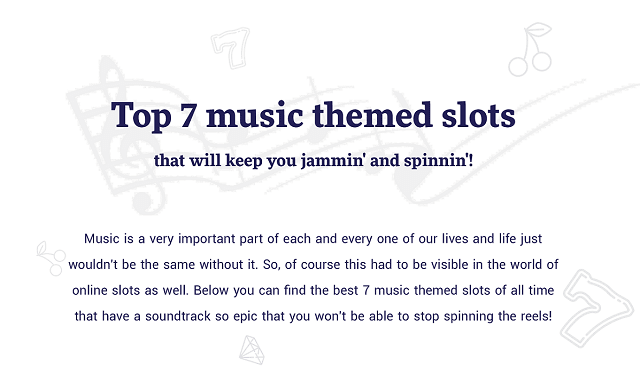 Top 7 Music Themed Slots #Infographic ~ Visualistan '+g+"
"Music has charms to soothe a savage breast" and gambling is a great pastime to enjoy when you want some excitement and instant gratification. So why not combine the two and enjoy both of them? Find out what happens when music genres get radically transformed into slot machines while still maintaining their unique, appealing features and flavors. In case you're a country music fan, you have surely heard of Dolly. She is the protagonist of the free slot of the same name. With 40 lucky paylines and a great playlist, you will be playing this game 9 to 5. At the Copa, you can experience a great feature, excellently applied to this casino game genre. The double up feature can significantly turn your game around at any moment. Jimi Hendrix will take you into a Purple Haze when playing the NetEnt free casino slot. Many symbols and special win-enhancing elements can be uncovered on the reels of this slot. If a tougher type of music is more your fancy, you might want to try out the Guns N’ Roses slot machine. The Wild Symbol comes with an Appetite for Destruction and turns into a Stacked Wild. Going even further into the genre, the Megadeth inspired game has a cool Mega Nudge distinguishing feature to enhance your fun and your wins at the same time. Michael Jackson also makes and appearance on the list. And how could he not? The King of Pop is always welcome where music is concerned. Let talented providers like Betsoft turn you into a Rockstar and have a fun time tweaking your gambling strategy on the reels.